In an interesting turn of events, Applesfera has retracted their claim that Engadget’s iPhone was a Japanese knockoff saying that the reader who sent in the photo admitted it was fake. It is incredibly likely that the next version of the iPhone will look like the photos you see in the gallery below, and we certainly wouldn’t claim that if we didn’t have good reason to believe it. So, why didn’t he write something along the lines of: “we’ve been given more information that we can’t publish that leads us to believe that this is indeed the real deal” in they’re original report? It very well could have been an oversight but why did it take until the second update to their followup post to say something to that effect? It boggles the mind. The biggest piece of evidence that this is a real prototype is that Gizmodo has the device and has written an extensive look at the new hardware features. They weren’t able to boot the device as it had been remotely wiped and without a hardware-specific firmware file they haven’t been able to get anything more than the connect to iTunes screen. But, the device does appear in iTunes when connected to a computer. Gizmodo’s Jason Chen says that the handset was lost in a bar in Redwood City and disguised inside of a case that made it look like an iPhone 3GS. It’s been an open secret to those of us in the racket that Gizmodo purchased this unit about a week ago, from those who claimed to find it. Gizmodo mentions that they have had it for a week but never mentions that it was purchased. I don’t have any problem with them purchasing the device but I find it a little disingenuous for them to act as if they don’t know who had the device before them. Jason Chen details some of the hardware improvements in their write-up which include an improved camera, camera flash, front-facing camera, micro-SIM (instead of a regular SIM card), improved display, a secondary mic likely used for noise cancellation, split buttons for volume, and metal power, mute, and volume buttons. 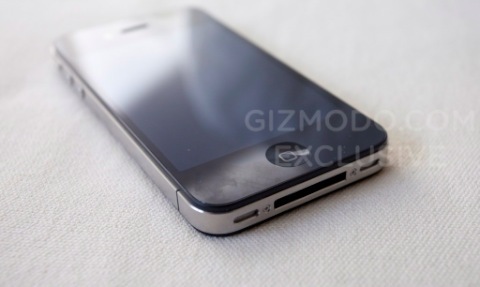 Gizmodo says that it is 3 grams heavier and has a 16% larger battery. What we still don’t know is how close this device is to the final design. I strongly believe that the back of the fourth generation iPhone will be made of this ceramic material but I don’t believe the sides to look anything like this. I find it hard to believe that Apple would let a working device outside their doors that looks anything like what we’ll see in June. I believe the sides will be made out of the same material but won’t look like they do in the photos Engadget and Gizmodo have published. I think this device is a field test unit made specifically to test the new ceramic back for radio transparency. But whether this is a field test unit or not, the folks at Apple can’t be anything less than pissed about this whole ordeal. I just wonder how Gizmodo is going to be treated when invites are sent out for Apple’s next event.